For more articles on the Lindsay please use the menu on the right. 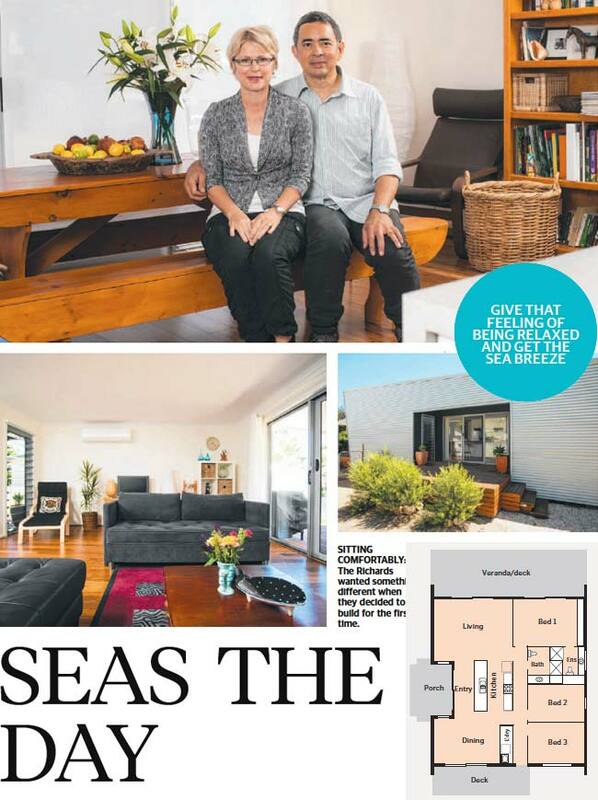 Jeff and Jocelyn Richards wanted something "a little different" when building their beachside holiday home. They found their ideal design with Sarah Homes' Lindsay 3e - a striking singlestorey home with a shale grey Colorbond facade. The design features three bedrooms, two bathrooms, a European laundry and a central kitchen flanked by dining and lounge areas, which open to two hardwood decks for relaxing and entertaining, seamlessly blending the indoors with the outdoors. "It was our first time building so we went to a few display homes and had a look, we wanted something a little different from the standard designs and we found this one we liked," Jeff says. "It's a different design, out of the ordinary, and it gives the feeling of space and allows a good amount of light in." They wanted somewhere where they could unwind. "We wanted it to be a comfortable place to go to and give that feeling of being relaxed and get the sea breeze in," Jeff says. The couple stuck to the original floorplan of the home, albeit with some modifications including enlarging the outdoor decks. Upon entry to the home is the open-plan zone which includes the kitchen, dining and lounge areas. A small deck running off the dining space was extended by half a metre. The main deck, accessed via the master bedroom and living room, was widened by a metre and a veranda added to make it weather-proof. The two decks are great spaces to entertain large groups, Jeff says, with the adults using one and the kids the other, so that each have their own space connected by the open-plan zone. "It's a great place for people to chill out and relax," Jeff says of the final outcome. The three bedrooms, including a master with ensuite, are accessed via a private hallway which is also the pathway to the laundry. Bedrooms two and three and guests are serviced by the central main bathroom. Decor-wise, the couple chose neutral tones so the home wouldn't date quickly, and added colour with accessories. Feature walls were painted in the dining and lounge areas to add contrast, and provide the perfect spot to place pictures taken by Jeff, who is an avid photographer. Bamboo floors were selected to give the home a "tropical feel". "We never thought it would be anything else," Richard says. Being first-time builders, Richard says working with Sarah Homes couldn't have been easier. "They were so organised, that's what was very impressive," Richard says. "They took you through all the steps... there was no confusion throughout the whole process." For more information about the house in this story please look at the Lindsay 3e.